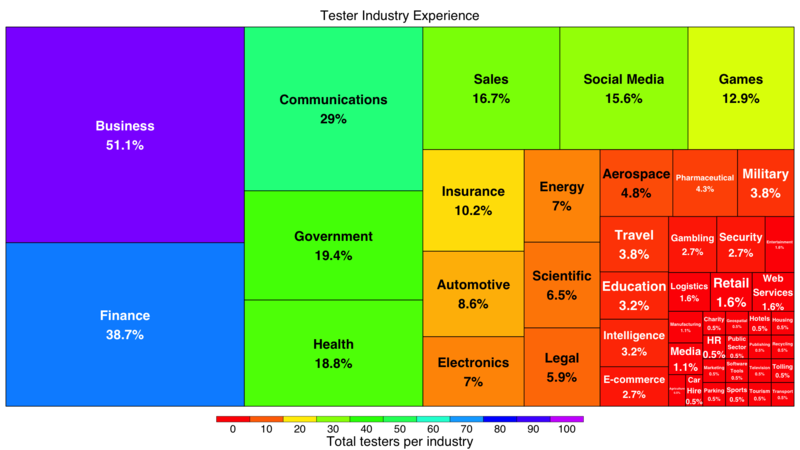 For each industry, the lower the %, the harder it may be to find someone with experience of testing in that specific industry. For example the tree plot shows that it’s harder to find someone with experience testing social media software than it is to find someone with experience of testing financial software. On the following plots because the number of testers in the groups for “less than a year” and “one to two years” were very small so I chose to group them together into a ‘less than two years’ group. Before I carried out my survey, I had previously held a belief that the vast majority of testers were falling into testing ‘by accident’ without actively choosing a testing career path while in education. This was one of the reasons I included the question ‘While you were studying did you know you wanted to work in testing?’. The response to this question is shown below. Being second from last jobs and careers fairs don’t seem an especially effective way of recruiting testers. Unemployment seems much more of a motivator to apply for a testing job. Software Testers come from a huge variety of different backgrounds. We are a diverse group of people who took a variety of paths into our careers. There is no one thing that testers specifically do to become testers but a lot of us are drawn to the profession because we find it interesting. Most testers are graduates but quite a few of us don’t have a degree. There isn’t a single degree or training course that churns out good testers. Hands on experience is very important because once a tester has gained some experience, formal education no longer matters quite so much. There has certainly been a trend in the last couple of years to hire new testers which do not come from a computing background. Most testers move into testing from a non-testing job rather than from education. Levels of testers entering the profession straight from education in the last two years are the lowest they have ever been. This post was also published on my software testing blog Mega Ultra Super Happy Software Testing Fun time.